Since more and more of my readers are asking about Java 8 interview questions to me, I have started a series where I take one or two topics and share 15 to 20 interview questions. This is the second part of that series, in the first part, I have shared lambda expressions interview questions and today we'll some Stream API and Functional programming interview questions. All the questions are meant for Java developers and related to whatever functional programming concepts and tools available to Java developers in JDK 8. To be honest, even though these are frequently asked Java 8 Interview questions, they are not at all very difficult and just focus on essential Java 8 concepts, rather than it's complex implementation. They are also not a functional heavy, but, if you are interested in true functional programming something like the Scala and Haskel has implemented, I suggest you check the Functional Programming for Beginners course with Scala. I have bought in just $11 a couple of days ago and it's really awesome. Without any further ado, here is a list of some of the common yet popular functional programming and Stream interview questions for Java programmers. If you have any other Java functional programming question or anything related to JDK 8 Stream API, feel free to share with us and I'll try to find an answer for you. The main difference between a Collection and Stream is that Collection contains their elements but Stream doesn't. Stream work on a view where elements are actually stored by Collection or array, but unlike other views, any change made on Stream doesn't reflect on original collection. The map() function perform map functional operation in Java. This means it can transform one type of object to other by applying a function. For example, if you have a List of String and you want to convert that to a List of Integer, you can use map() to do so. Just supply a function to convert String to Integer e.g. parseInt() to map() and it will apply that to all elements of List and give you a List of Integer. In other words, the map can convert one object to other. If you want to learn more about these new methods introduce in Java SE 8, I suggest you take a look at The Complete Java Masterclass course on Udemy. One of the most comprehensive courses which cover everything Java developers need to know. The filter method is used to filter elements which satisfy a certain condition which is specified using Predicate function. A predicate function is nothing but a function which takes an Object and returns a boolean. For example, if you have a List of Integer and you want a list of even integers. In this case, you can use the filter to achieve that. You supply a function to check if a number is even or odd, just like this function and filter will apply this to stream elements and filter the elements which satisfy the condition and which doesn't. The flatmap function is an extension of the map function. Apart from transforming one object into another, it can also flatten it. For example, if you have a list of the list but you want to combine all elements of lists into just one list. In this case, you can use flatMap() for flattening. At the same time, you can also transform an object like you do use map() function. Even though both map() and flatMap() can be used to transform one object to another by applying a method on each element. The main difference is that flatMap() can also flatten the Stream. For example, if you have a list of the list then you can convert it to a big list by using flatMap() function. 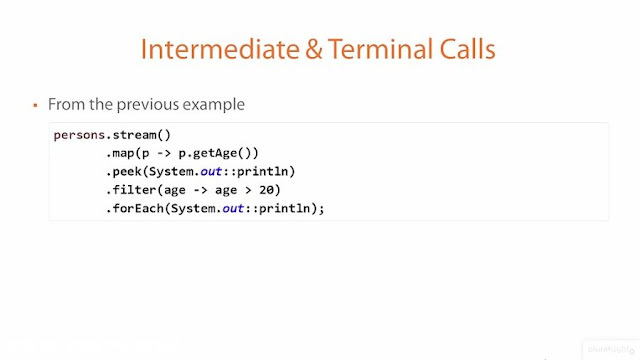 Btw, if you find trouble understanding these functional programming methods like map, flatMap, filter etc, I suggest you go through From Collections to Streams in Java 8 course on Pluralsight. It's an advanced course but very good. Btw, you would need a Pluralsight membership to access this course, which costs around $29 monthly or $299 annually (14% discount). I have one and I also suggest all developers have that plan because Pluralsight is like NetFlix for Software developers. The intermediate Stream operation returns another Stream which means you can further call other methods of Stream class to compose a pipeline. For example after calling map() or flatMap() you can still call filter() method on Stream. On the other hand, terminal operation produces a result other than Stream e.g. a value or a Collection. Once a terminal method like forEach() or collect() is called you cannot call any other method of Stream or reuse the Stream. The peek() method of Stream class allows you to see through a Stream pipeline. You can peek through each step and print meaningful messages on the console. It's generally used for debugging issues related to lambda expression and Stream processing. When we say Stream is lazy we mean that most of the methods defined on java.util.stream.Stream class is lazy i.e. they will not work by just including them on Stream pipeline. They only work when you call a terminal method on the Stream and finish as soon as they find the data they are looking for rather than scanning through the whole set of data. As the name suggests, a functional interface is an interface which represents a function. Technically, an interface with just one abstract method is called a functional interface. You can also use @FunctionalInterface to annotated a functional interface. In that case, the compiler will verify if the interface actually contains just one abstract method or not. It's like the @Override annotation which prevents you from accidental errors. Another useful thing to know is that If a method accepts a functional interface then you can pass a lambda expression to it. Some examples of the functional interface are Runnable, Callable, Comparator, and Comparable from old API and Supplier, Consumer, and Predicate etc from new function API. 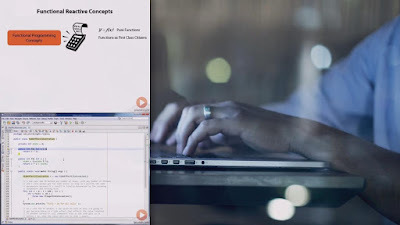 You can learn more about those interface in Java What's New in Java 8 on Pluralsight. The normal interface in Java can contain any number of the abstract method while the functional interface can only contain just one abstract method. You might be thinking why they are called functional interface? Once you know the answer, it might be a little easier for you to remember the concept. Well, they are called functional interface because they wrap a function as an interface. The function is represented by the single abstract method on the interface. The findFirst() method will return the first element meeting the criterion i.e. Predicate while findAny() method will return any element meeting the criterion, very useful while working with a parallel stream. You can further see this article for a working example of findFirst() method in Java 8. A Predicate is a functional interface which represents a function, which takes an Object and returns a boolean. It is used in several Stream methods e.g. filter() which uses Predicate to filter unwanted elements. You can see it just has one test() method which takes an object and returns a boolean. The method is used to test a condition if it passes it returns true otherwise false. The Supplier is a functional interface which returns an object. It's similar to the factory method or new() which return an object. The Supplier has get() functional method which doesn't take any argument and return an object of type T. This means you can use it anytime you need an object. Since it is a functional interface you can also use it as the assignment target for a lambda expression or method reference. A Consumer is also a functional interface in JDK 8, which represents an operation that accepts a single input argument and returns no result. Unlike other functional interfaces, Consumer is expected to operate via side-effects. The functional method of Consumer is accept(T t) and because it's a functional interface, you can use it as the assignment target for a lambda expression or method interface in Java 8. 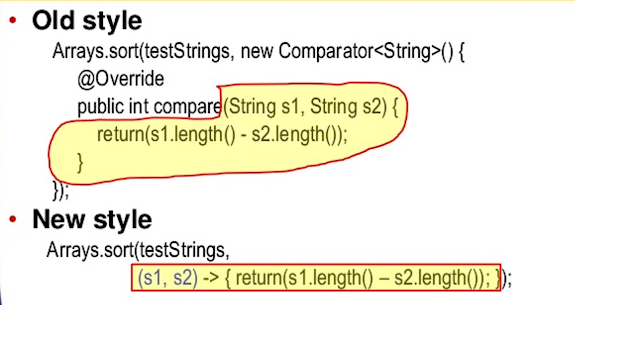 So, yes, it's possible to convert an array to Stream in Java 8. You can even convert an ArrayList to Stream as explained in that article. 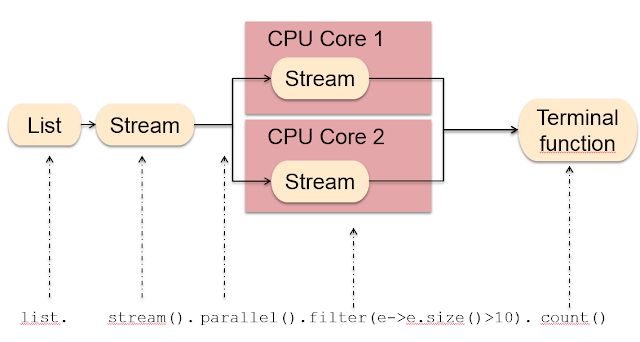 A parallel stream can parallel execute stream processing task. For example, if you have a parallel stream of 1 million orders and you are looking for orders worth more than 1 million then you can use a filter to do that. Unlike sequential Stream, the parallel stream can launch multiple threads to search for those orders on the different part of Stream and then combine the result. 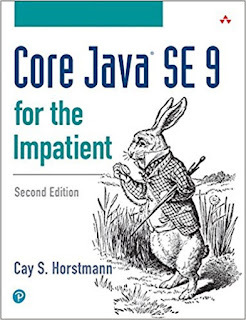 In short, the parallel stream can paralyze execution but, as Cay S. Horstman mentioned in Core Java SE 9 for the Impatient, there is significant overhead or parallelism which only pays off if you are doing bulk data operation. That's all about some of the common Java 8 Stream and Functional programming concepts based interview questions. Since, Java 8 is now the modern way of writing Java code, more and more companies are looking for Java developers with good Java 8 skills. This means you can expect more Java 8 based question on Java interviews in years to come. Thanks for reading this article so far. If you like these Java 8 Functional Programming and Stream API interview questions and my answers then please share with your friends and colleagues. If you have any doubt or feedback then please drop a note.